Ionization chamber is a radiation detector used for detecting and measuring charge from the number of ion pairs created within a gas caused by incident radiation. It consists of a gas-filled chamber with two electrodes; anode and cathode, in which a voltage is applied to maintain an electrical field. 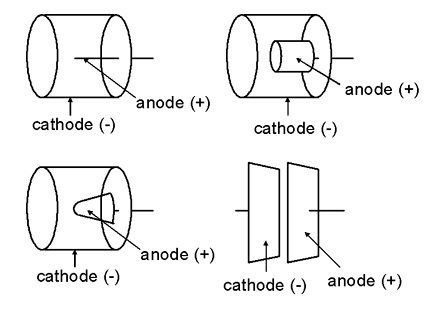 The anode is positively charged with respect to the cathode, and in most cases the outer chamber serves as the cathode. When the gas between the electrodes is ionized by incident ionizing radiation, it creates positive ions and electrons under the influence of the electric field. These particles move to the electrodes of the opposite polarity causing ionization current which is measured by an electrometer circuit. 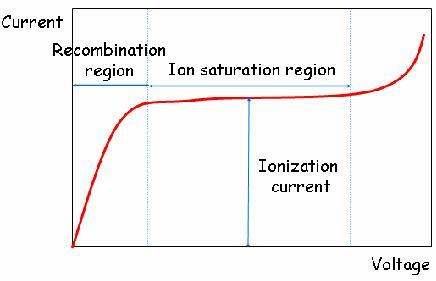 The ionization current is the measure of the total ionizing dose entering the chamber. Each ion created by the interaction between the incident radiation and the gas, generates an electric charge, such that the accumulated charge is proportional to the number of ion pairs created hence the radiation dose. The electric field enables the ionization chamber to work continuously by mopping up electrons which can cause recombination of ion pairs which can result to reduction of the ion current. This makes the output signal in ionization chamber a continuous current unlike the Geiger-Muller tube that produces pulse output. Ion chambers have a good response to radiation over a wide range of energies making them applicable in different fields such as, research laboratories, radiography, nuclear power industries, radio-biology and environmental monitoring. The interactions of charged particles (either direct charged particles or secondary Particles produced by interactions with photons or neutrons) with a gas lead to ionized and excited molecules along the path. The important information is the total number of Electron-ion pairs created along the track of the radiation. The W-value is defined as the average energy lost by the incident particle per ion pair formed. Due to the competing mechanism of the energy loss, i.e. excitation, W-value is always greater than the ionization energy. The table below shows W-values for common gases. Ion chamber are used between 0.1cc to 1.0cc for routine usage. For example, if we want to keep the leakage current at 1 % level of an ionization current of 1 pA for an applied voltage of 100 V, the insulator should have a resistance of 1016ohms. Moreover, moisture or surface contaminants can make additional troubles. Practically, a guard ring is employed to reduce this insulator leakage in low current applications of ion chambers. As shown in Fig. 3.3, the insulator is segmented into two parts. Most of the applied voltage appears across the outer insulator, for which the resultant leakage current does not contribute to the measured current I. The magnitude of the ionization current is too small to be measured using standard galvanometer techniques. An electrometer, i.e. highly sensitive electronic voltmeter, indirectly measures the current by sensing the voltage drop across a series resistance (109 ~ 1012 ohms) as shown in Fig. 3.4. Provided the ion current does not change for several values of the time constant RC, its steady state value is given by I = VR/R. 5.Ionization Chambers. Oak Ridge Associated Universities. 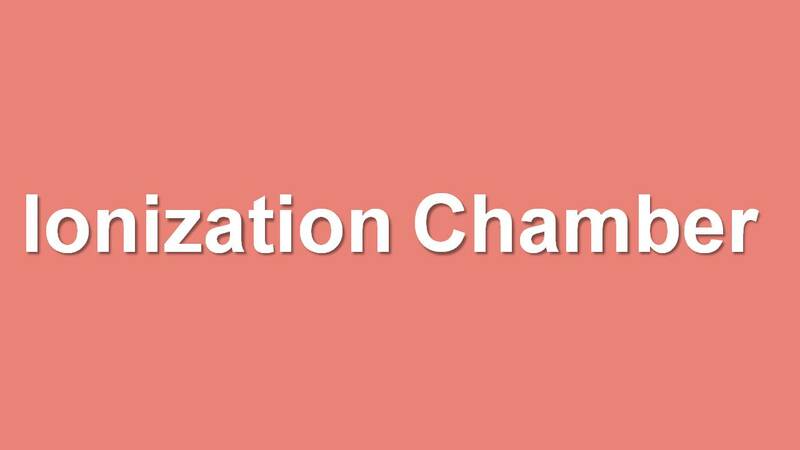 https://www.orau.org/ptp/collection/ionchamber/introionizationchamberr.htm. Retrieved on 11/3/2018. 6.Ionization Chamber. Wikipedia. https://en.wikipedia.org/wiki/Ionization_chamber. Retrieved on 11/2/2018.